All the video archives for OzHadou Nationals 14 tournaments are now available for viewing on our YouTube channel. We’ve embedded all the playlists after the jump for those who want to catch up on the action! The biggest OHN in history is in the books and we sat down with E.G.’s very own K-Brad to briefly catch up on everything that went down over the weekend. The biggest OzHadou Nationals in history is all said and done and OzHadou would like to extend a huge thank you to everyone came out and supported to make the event as successful as it was. It’ll probably be a couple of days before the more extensive write-ups surface, in the meantime hit the jump for a look at all the brackets. So you’ve missed the registration deadline, or you just can’t make it to OHN. We forgive you. You’re in luck, though; almost every tournament at OHN14 will be streamed live and free on Twitch! We’ve put together a stream schedule so you can find out when and where your favourite games are going to stream over the weekend. To make life even easier for you, links to all of this year’s official tournament streams are listed below after the jump. The 14th OzHadou Nationals kicks off in less than 2 days! We have some more important updates for everyone following OHN14: the official tournament brackets and stream channels for our premier 3-day fighting game event. The tournament brackets are now available! All Smash Bros. game brackets, including Project M and SSB64, are available in smash.gg while the rest of the brackets can be found in the OzHadou Challonge page. You can also view a summary of your pool allocations and times by visiting the OHN14 competitors page. Here are all the Twitch channels that will be live-streaming the action at OHN14 this weekend. Whether you’re watching on stream or in the Australian Ballroom at Menzies Sydney we look forward to your participation in OHN14 this weekend. Now that registration has closed and the brackets are almost ready, we have some important updates for everyone attending the OzHadou Nationals 14 this weekend. This includes information about the tournament schedule, check-in process, rules and other important matters. 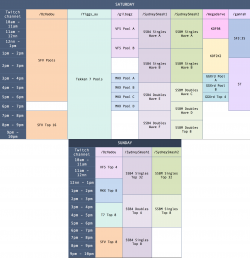 The final schedule for OHN14 has been announced. You can find full details courtesy of the official OHN14 website. 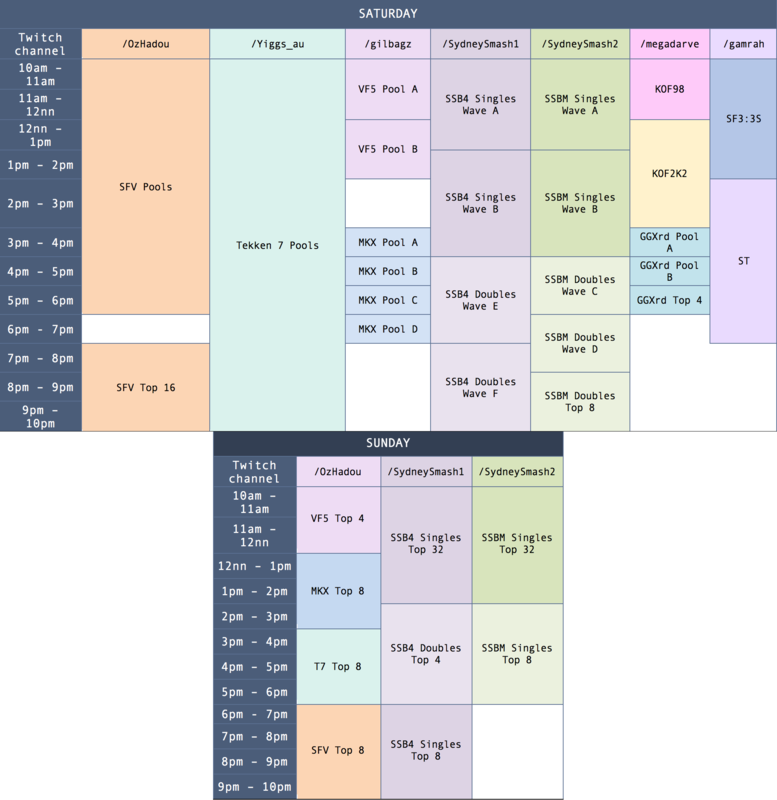 For anyone that has made plans based on the draft schedule, it’s worth noting that there have been no significant changes besides a condensing of the run time for the Project M tournament. All competitors must report to their pools on time at OHN14 or risk disqualification. We recommend you arrive 30 minutes prior to the commencement of your scheduled pool start time. Due to time constraints we must start all pools on time and we WILL disqualify players if necessary to ensure that happens. Attendees may only compete once they have received their competitor pass from the check-in desk. To avoid being stuck in a queue before your pool begins, we recommend competitors collect their pass on Friday wherever possible. Failing that give yourself plenty of time (say an hour or more) to collect your pass prior to the start of any pools. We will have a limited check-in desk presence on site Saturday morning from 9am for people who have pools commencing at 10am. All attendees must present their OHN14 confirmation email at the desk to receive their pass, so either print your receipt out beforehand or have it on your phone/tablet for us to inspect. Once we confirm your email against our records you will be able to enter the venue. Do not lose your pass! Without it you will not be able to enter the venue or, in the case of competitors, play any games, including tournament matches. We have an important update to the rules for Street Fighter V at OHN14: all top 8 matches will be best of 5 games, with all other matches being best of 3 games. This change brings OHN14 into line with other Capcom Pro Tour Asia tournaments that have recently taken place. Remember that the tournament rules are available on the OHN14 website and all players are assumed to have read and agreed to comply with the rules prior to entering the tournament. Rules will NOT be open to debate with players and the Tournament Director reserves the right to change these rules if deemed necessary for the good of the tournament. Soon we will publish the final tournament brackets online for all tournament games at OHN14, including DIY tournaments. We will also provide a list of the stream channels that will be covering the event. Check this site and the OzHadou Facebook page for all the latest announcements regarding OHN14. Keep an eye on OAFGC and Youssef’s Twitter to keep up to date with movements on the evening. See you all there!